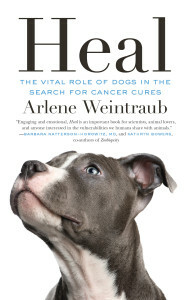 Available now: Heal: The Vital Role of Dogs in the Search for Cancer Cures (ECW 2015). Drawn from extensive research, on-the-ground reporting, and personal experience, this book explores the fascinating role dogs are playing in the search for a cure for cancer. Learn how veterinarians and oncologists are working together to discover new treatments — cutting-edge therapies designed to help both dogs and people suffering from cancer. Heal introduces readers to the field of comparative oncology by describing several research projects aimed at finding new therapies for cancers that are similar in dogs and people, including lymphoma, osteosarcoma, breast cancer, melanoma, and gastric cancer. Weintraub, who lost her sister to gastric cancer, also writes about the emerging science behind the remarkable ability of dogs to sniff out early-stage cancer, and the efforts underway to translate that talent into diagnostic devices for early detection of the disease. In the course of bringing these dogs and their human companions to life, Weintraub takes her own personal journey from grief to healing, as she shows her readers how man’s best friend might be the key to unlocking the mysteries of cancer. “A new book stems from a truth many a dog owner knows: Man’s best friend is deeply susceptible to cancer.” —Newsweek “Best Books About Cancer.” Read more here. “…chock-full of thought-provoking data-backed stories, in which experts in canine and human cancer weigh in….Ms. Weintraub has produced a fine book about the hope and possibilities that abound in today’s era of cancer research and treatment. This book is highly recommended….” American Society of Clinical Oncology’s ASCO Post. Read more here. “[A]n incredibly important report….This book is science, emotion and love of dogs all mixed together.” —Steve Dale, “My Pet World,” Tribune Media Services. Read more here. “Author Arlene Weintraub—a frequent contributor to CURE magazine and a lifelong dog owner—does more than share facts. She tells the stories of special dogs, their owners, the researchers who entered their lives—and her own loss of a loved one to cancer.” —CURE. Read more here. “The author did a wonderful job researching the topics and presenting them in such a way that even the most difficult medical terminology could be understood by the common lay person. If you love dogs and want to learn how our faithful companions are helping us extend our lives, this is definitely a book to look into. I highly recommend it!”—Night Owl Reviews “Top Pick.” Read more here. “In a new book, Heal, dog lover and science journalist Arlene Weintraub conducts a brisk and often-moving tour of the frontier of comparative oncology. She describes cutting-edge research aimed at treatments for such ailments as lymphoma, breast cancer, and gastric cancer, the last of which took the life of Weintraub’s older sister, Beth, at the age of 47—a loss that animates the author’s account.” —BloombergBusiness.com. Read more here. Read an excerpt at Salon.com. Get the latest book news on the Heal website. Available now from Amazon, Barnes & Noble or your favorite bookseller.